Biography - John Henry Patterson - Commander of the Jewish Legion - "Mad for Zion"
Colonel John Henry Patterson (1867-1947) was a pioneer Christian Zionist, commander of the Jewish Legion, British colonial soldier and administrator, author and friend of Zionist leaders. He was born Nov 10, 1867 at Forgney, Ballymahon, South County Longford, Ireland to a Protestant family. He left school at 16, but was very widely read, especially on the Bible and Jewish history. In March 1885 he joined the third Dragoon Guards, claiming falsely to be 19 years old, and in 1888 he was sent to India. In 1892, having attained the rank of Sergeant, he was transferred to the 16th Lancers in Lucknow. In 1895, he returned to England where he married Francie Helena Gray, a doctor in Law from North Belfast. In 1898 he undertook to oversee the building of a bridge in East Africa. The work was plagued by man-eating lions. Patterson killed the lions and wrote a book, The Man-Eaters of Tsavo, which brought him some fame. He retuned to the army to fight in the Boer war with a commission as a lieutenant, serving under Allenby. While he was serving in East Africa as a game warden, a fellow soldier under his command, Corporal Audley Blyth, died or committed suicide under mysterious circumstances. A son, Bryan, was born in March 1909, possibly to Byth's wife Ethel, who may have been Patterson's mistress. Bryan was raised by the Pattersons as their own son. Patterson was on the "retired" lists from 1908-1911. He left the army in 1911. Patterson rejoined the service in 1914, upon the outbreak of World War I, and saw service in Flanders. He was then sent to Egypt. In Alexandria, he met Joseph Trumpeldor and Zeev Jabotinsky who were attempting to form a Jewish military force. He landed with the corps at V Beach, east of Cape Helles, Gallipoli in April of 1915, after the Mule Corps personnel had been in training for only about three weeks. About half the Mule Corps personnel were seconded to the Anzacs, who treated them discourteously and had them shipped back to Alexandria. The 300 men under Patterson landed April 27 off the Dundrennon. The Zion Mule Corps served with distinction. Among the 300 men who saw action, there were 14 dead. The Mule Corps was disbanded either in January or May of 1916. Patterson had fallen ill at the end of November and was evacuated to Alexandria and thence to London. 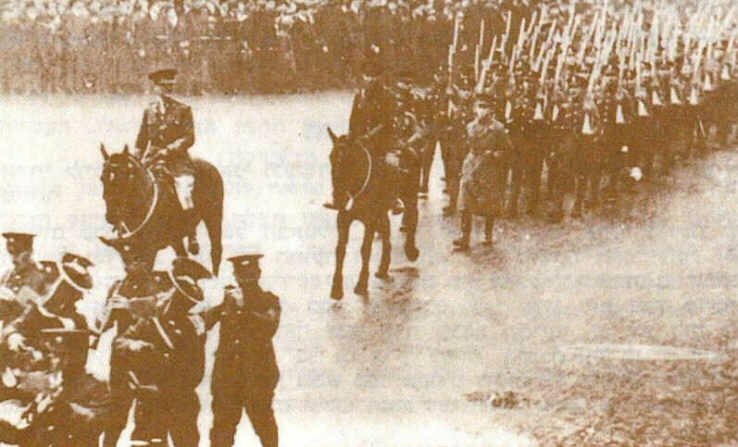 Patterson returned to Ireland where he commanded the 4th Royal Irish Fusiliers and fifth Royal Dublin Fusiliers. On July 17, 1917, he was made commander of the 38th Battalion of the Royal Fusiliers, one of three battalions of the Jewish Legion, recruited from British and foreign Jews. Patterson was promoted to full Colonel. Jewish Legion on parade under Col. Patterson in the Whitechapel Road, February 22, 1918. It is falsely stated in several histories that the Jewish Legion never saw service in Palestine. It is true that British commanders were often anti-Semitic and tried to keep the Jewish Legion out of the fighting. Patterson and the 38th Battalion were kept out of the fighting in Palestine until June of 1918, when they arrived from Egypt and were stationed in Sarafend camp. They were then sent to relieve the Grenadier Guards in Jaljulya, and then attached to the 60th division and sent to the Jordan valley, where they formed a key pivot of the British line along the Melhallah rift. On September 19, 1918, the battalion crossed the river at Umm Es Shert. They advanced and held Es Salt in what later became Transjordan. Following the armistice with Turkey on October 31, 1918, the 38th Battalion was sent to Rafa and Patterson was made commander of the Rafa area in February of 1919, commanding Sinai, Gaza and southern Palestine. In May of 1919 the 38th battalion was amalgamated with the 39th and 40th under the Lahore Division. It was renamed the "First Judeans" and assigned garrison duty in Palestine. In January of 1920 Patterson retired and was replaced as commander of the Judeans by Col. Eliezer Margolin. The Judeans were disbanded in 1921, after Margolin had used them to defend Jews under attack in Jaffa. Patterson wrote two books about his experiences as commander of Zion Mule Corps and Jewish Brigade, With the Zionists at Gallipoli (1916) and With the Judeans in Palestine (1922). Patterson also traveled to Palestine in 1933 at Jabotinsky's request and sat in at the Arlozoroff murder trial. In 1940 he moved to California with his wife Francie. He was close to Ben-Zion Netanyahu, father of Benjamin Netanyahu. In 1947, he suggested the Irgun hit at British bureaucrats in Palestine. He died June 18, 1947. His wife died six weeks later in a California nursing home. Both were cremated and their ashes sent to Palestine, but their place of burial is not known. .
*Katz, Shmuel, Lone Wolf: A Biography of Vladimir (Ze'ev) Jabotinsky, New York 1995. Thanks go to Joe Hochstein for these quotes and information. Patrick Streeter, Mad for Zion: A Biography of Colonel J.H. Patterson, 2004.